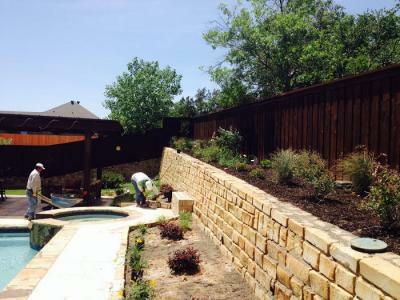 Groundscape Solutions, A Fort Worth Landscaping Company, Repairs a stone retaing wall and then installs plants. We can build a new retaining wall or repair an exisitng wall. Give us a call at 817-759-0102 for a quote or visit our website at www.groundscape.com Groundscape Solutions is a fully insured landscaping company and will provide references.